Kui Lee. I never met him. (Many of his most ardent fans never had a chance to meet this iconic figure whose life was cut too short – given over to cancer – at the tender age of only 34.) But his presence in my life was very strong from the moment I was born. He was a friend of our family long before I came along. His record played constantly in our home – my mother’s favorite until the day she died. And mom would sing me to sleep with “Ka Makani Ka`ili Aloha” – a song she learned by wearing out Kui’s one and only commercial release, “The Extraordinary Kui Lee,” ironically released only a day before Kui’s death on December 3, 1966. Kui’s story has been chronicled over and over again. (I have heard that there has long been a biopic about him in the works, and this, too, would be most welcome.) But most of what I learned about him I learned by spending endless hours talking story with his widow. To the world she was Nani Lee. But to me she was simply “Auntie Frances.” Through her I came to understand Kui’s life, his work, his motivation and inspiration, his politics, his time… Kui was a complex – dare I say “enigmatic” – figure. Like many local Hawai`i musicians before and since, he divided his people. Many thought that Kui wrote of the modern Hawaiian in a style to which his generate could no doubt relate. Others felt he had abandoned his roots – admonished him for writing songs in English. Unlike some other local musicians, Kui didn’t care. He pursued fame – it was in his blood – but was fairly certain he couldn’t find it in his Hawai`i home. He cared about being true to himself – the hallmark of an artist. Kui was born into a family of entertainers who were constantly on the move. Wherever the show went, so, too, his family would follow. His father, Billy, was a natural comedian, a drummer, and – of tremendous interest to me – a fine falsetto singer who performed in groups led by such illustrious names in Hawaiian entertainment as Ray Kinney, Pua Almeida, Val Hao, and Tommy Castro. His mother, Ethel, was a singer and a dancer. And so Kui was born in Shanghai while the family was on tour. A child of the sand and the surf – a real beachboy, Hawaiian style – Kui and school were not a good “fit.” He eventually dropped out – or perhaps was kicked out – of both Roosevelt High School and Kamehameha Schools and joined the Coast Guard. But Kui’s desire for fame – and his wanderlust – eventually led him to the west coast to try his hand at fire knife dancing and – in case you didn’t know – a turn as a Hollywood stunt man. He eventually made his way east performing from Miami to New York City where Kui settled by the early 1950s. Kui was not merely an amazing stage presence and musician. He was also an astute businessman. Kui continued to assemble his portfolio until he was appearing in the finest showrooms in New York City and making appearances on the Steve Allen Show, the Ed Sullivan Show, the Arlene Francis Home Show, and the Patti Page Show. But Kui was also practical. He combined his love of music and his need for a steady income by taking a position writing songs for other singers – and even commercial jingles – in the famed Brill Building in NYC where he rubbed elbows with such up-and-coming songwriting legends as Burt Bacharach and Hal David, Neil Sedaka, and Carole King. If you have never been able to locate or hear any of the songs Kui wrote during his Brill Building period from 1955 through 1961, it may be because he wrote and published these tunes under a pseudonym. Kui met with mixed success on the mainland. He worked regularly as an entertainer including a lengthy stint as dancer and choreographer at the famed Hawaiian Room of the Lexington Hotel. But his songwriting may have been – arguably – too ahead of his time – the lyric content intensely personal, the harmonic structures more jazz-oriented than pop (more complex even than Bacharach’s, although Burt was no doubt a mentor and an influence for Kui in the Brill Building days). But Kui made one last-ditch attempt at the big time before his return to Kane`ohe in the early 60s. 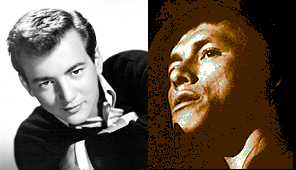 He was discovered by Bobby Darin who signed Kui to a recording contract and began to make him over into his tried-and-true teen idol, “Splish Splash” image. The attempt largely failed, and the professional relationship was short-lived. Darin only released ten 45rpm singles on his label by a whopping three artists he had recruited before folding up shop, and this early failure was no doubt in part to the lack of sales and radio play of Kui’s lone disc for the label. The songwriting – which was not Kui’s since he couldn’t write in this dumbed-down pop style – was dreck, and Kui’s performance was lackluster – likely because he couldn’t subscribe to the material he was given to sing. Kui’s singles for Darin were released on March 21, 1960. By April 9, 1961 – only a year later – Kui was appearing on the Ed Sullivan Show with his troupe, The Modernasians. Did the public have a change of heart about Kui’s changing musical style? Not exactly. Kui’s last performance on national television did not find him singing his or anyone else’s compositions. The Modernasians were a fire knife dance troupe. Tune in to Ho`olohe Hou Radio throughout the month of March as we feature these two rock-and-roll sides by Kui Lee on our segment entitled “Rarities” several times a week.